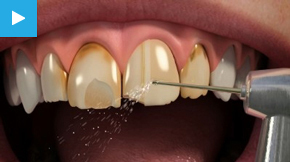 Are your teeth stained, chipped, or not aligned on top of each other? Veneers, crowns and bridges are good treatment options to consider because they look like natural teeth and don't require a longer procedure like having braces. A veneer is a very thin, tooth-coloured piece of porcelain (like a false finger nail) that is bonded on top of your own tooth. Based on your needs, we can use veneers, crowns and bridges or a combination of them. The shape of your veneers, crowns and bridges can be adjusted to make your teeth overall look longer and/or closer together. You can have just one veneer (crown) or a whole set, known as a smile makeover. Veneers and crowns can also be used to close small gaps and bridges can be used to closed the bigger gaps, when braces are not suitable. If one or multiple teeth are slightly out of position, a veneer, a crown or combination of them can sometimes be fitted to bring it into line with the others.